One Selected Photo "Oceans & Ships"
A tidal barrage allows water to flow through as the tide rises and then traps the water by closing sluice gates. > At low tide the trapped water is released through turbines to generate electricity. > In the UK there are several estuaries that are suitable for tidal barrages. > Tidal barrages are very expensive to build but they can generate huge quantities of electric power. 模式図キャプション：　"Water is released through turbines to generate electricity." 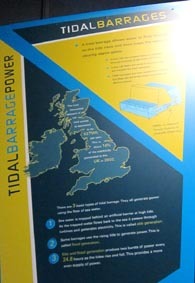 > The total theoretical amount of UK tidal power is estimated to be 53 TWh per year. This is about 14% of the electricity generated in the UK in 2002. > There are 3 basic types of tidal barrages. They all generate power using the flow of sea water. 1. Sea water is trapped behind an artificial barrier at high tide. As the trapped water flows back to the sea it passes through turbines and generates electricity. This is called ebb generation. 2. Some barrages use the rising tide to generate power. This is called flood generation. 3. Ebb and flood generation produce two bursts of power every 24.8 hours as the tide rise and fall. This provides a more even supply of power. > Building a tidal barrier or fence across an estuary will have a major effect on the natural environment. The construction phase of a project can badly impact on the estuary environment. > If the tidal flow of an estuary is reduced serious environmental problems can occur. Water can become stagnant wihch is very bad for the wildlife that uses the estuary. 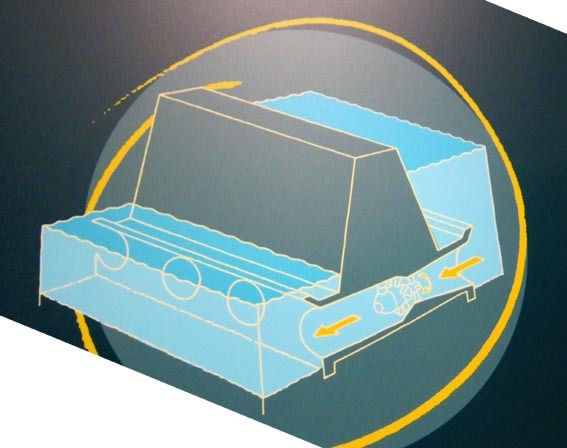 > The amount of salt in the water behind the barrier can re reduced. This will effect the creatures that live there. > Once completed a tidal barrier may actually have a positive effect on the water quality. This might allow new species of wildlife to thrive. 47% of European geese visit UK tidal estuaries. 28% of European swans and ducks visit UK tidal estuaries. At the Annapolis Royal tidal barrier in Canada, fish were being killed in the turbines. Fish are now warned to stay away by a loud underwater thumping sound. Tidal lagoons are thought to be much less damaging to the environment than tidal barriers.